Nicholas Chevalier was born in St Petersburg, the son of a Russian mother and Swiss father. He studied in Lausanne in Switzerland, Munich, London and Rome before arriving in Australia in 1854. Chevalier worked for 'Melbourne Punch', contributed to 'Victoria illustrated', made colour lithographs and exhibited his work, establishing himself as a leading figure in art in Melbourne. He travelled extensively throughout the 1860s, including to New Zealand, Tahiti, Hawaii, Japan, China and India before settling in England in 1870. Edouard Levi Montefiore, the donor of this watercolour to the Gallery, was the brother of Eliezier Levi Montefiore, the Gallery's first Director. He lived in Paris. Signed and dated l.r. corner, brown watercolour "N Chevalier/ 1868". 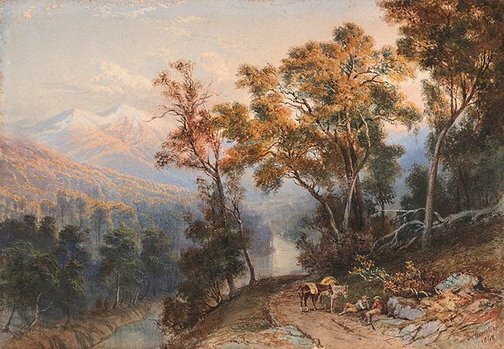 19th century Australian watercolours, drawing and pastels from the Gallery's collection , Sydney, 2005, 60 (colour illus. ).